The anniversary of the declaration of the war was appropriately celebrated at Moorleah by the unveiling of two Honor Rolls, one in the State School and one in the Public Hall. The ceremony at the school took place in the afternoon in the presence of the scholars and their parents. The Honor Roll containing the names of 24 old scholars was then unveiled by two returned-soldiers of the district; Messrs. Roger Stuart and Frank Smith, the audience standing and singing the National Anthem. There was a large attendance again in the hall in the evening, including a number of visitors from Wynyard. Mr. C. Robey, as chairman of the meeting, stated that they had gathered to unveil the Honor Roll in memory of the men who went from Moorleah and Flowerdale districts to the war. These men had seen something of the real horrors of war, especially in France, and it was to prevent such horrors being experienced by the women and children of Australia that they had gone out to fight. 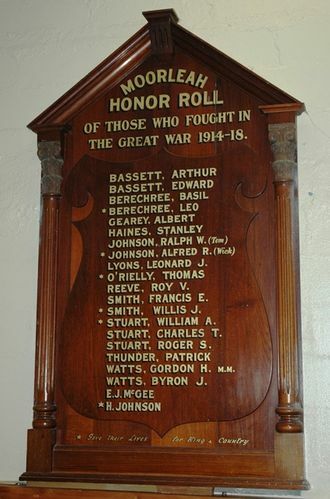 The Honor Roll, which adorns the wall of the hall, is made of substantial Tasmanian blackwood, with canopy top, and Corinthian pillars on the side , the central panel hearing an embossed shield, beautifully polished, and is inscribed with the names of the 19 men who went to the war from the district. Both material and workmanship are of the very highest quality, and the local residents have every justification for their boast that there is none better in the State. The work was executed by Messrs. Hills and Co., joiners, of Launceston. Advocate (Burnie) 9th August 1921.